MCR 32111 Luminator™, Driver Glove, Grain Cow Palm, Orange Back with reflective stripes This high visibility glove is all cow leather with a Gunn cut pattern and Keystone thumb for greater comfort and dexterity. It features a nylon hi-vis fabric back with shirred elastic wrist and black cotton hem. 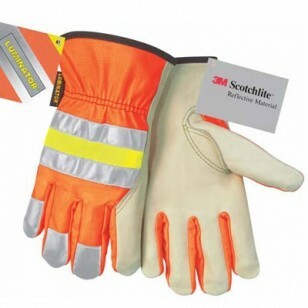 This glove contains 3M Scotchlite reflective material on the knuckle area and on 3 finger tips Be seen and be safe! Our high visibility gloves offer you the same tough and rugged performance you have come to expect with MCR Safety products while giving you brilliant hi-vis colors and retro-reflective material striping. The 32111 series features cow grain leather, orange back with relective and contrasting lime stripes, and keystone thumb.